Hi Michelle! Loving the premise for the new series. I'd love to know if any other supernaturals aside from psychics and demons are part of the Living in Eden world? Congrats on the release of your new book and on your RT Reviewers Choice Award! I've already read some positive reviews online for your new book. :) Darrok seems to be quite witty in the excerpt that I read on your website. Did you make a conscious effort for him to be funny rather than dark and brooding like a lot of heroes in UF/PNR? My favorite UF/PNR series that features demons is Lilith Saintcrow's Dante Valentine books. Her Japhrimel quickly became one of my favorite characters. _Demon in Me_ sounds like a great read! I'm always on the lookout for new paranormals. I haven't read any of yours books yet, but I have put them on my wishlist. But now, where to start, you have so much goodies out. I have seen as has everyone that paranormal and supernatural books have become very popular over the recent past and also mainly in the YA sector. What I have wondered (as a non YA) is firstly do you as an author believe in the paranormal/supernatural ? And secondly do you think these type of books have any adverse effect on YA readers ? I haven't read any of your books yet, but they sound like i should give them a try. My favourite series featuring Demons are 'The Darkest Powers' books by Kelley Armstrong and the 'Georgina Kincaid' series by Richelle Mead. 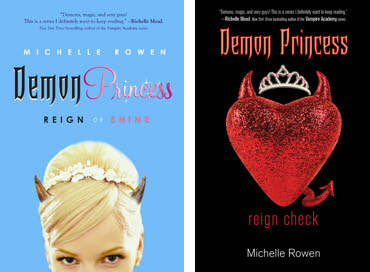 My favorite series that feature a demon are Richelle Mead's Georgina Kincaid series and Kim Harrison's Rachel Morgan series. Great interview.I love those covers. This new series sounds great. I can't wait to start to read this new series. One of my favorite demons is Al from Kim Harrison's Hollows series. He is a funny demon. Please count me in. I love the ideas of demons. Its a nice switch from the vampires. Thanks for the comments everyone! Great to be here today! @BuddyT: "What I have wondered (as a non YA) is firstly do you as an author believe in the paranormal/supernatural? And secondly do you think these type of books have any adverse effect on YA readers?" -- I don't really believe in the supernatural world. Maybe a smidge, but not a whole lot. And I really don't think my books would have ANY adverse affect on YA readers. The message in all my books is that no matter who you are, you can choose to be good and do the right thing and live with love in your heart. I think that's a pretty good message for younger people (and older people too). Do you find that demons have to be more ambiguous than vampires or that they both have darker sides to them? It sounds like a great idea for a book. I, too, am always looking for new series to read. As far as demon reads go, I love the series by Jacquelyn Frank and Larissa Ione. I love Sherrilyn Kenyon's Dark Hunter series which feature demons of a sort. Congrats on your RT award Michelle! Hi Michelle. I enjoyed your Immortality Bites series. My favorite series featuring demons is Lilith St Crow's Dante valentine series. my favorite demons are by Larissa Ione - I love her Demonica series. Congrats on the RT award! I've read the Vamp series and am excited to get my hands on the new Demon title. Who would you cast as your 2 main characters? Do you use music for inspiration, or while writing? And congrats on your RT award and your book release in Oct! And your new series launch! More power to you Michelle! I've enjoyed Michelle's Immortality Bites series and I'm eager to get started on the Living in Eden series. My favorite UF/PNR book featuring a demon is a series - The Crimson City series by several authors but spearheaded by Liz Maverick. Congrats on your RT Reviewers Choice Award!! I'm totally loving the blurb for the new series. I'm going to have to go with the hilariously snarky demon cat, Giguhl, in Jaye Wells' Sabania Kane series. Though I also love Al in Kim Harrison's The Hollows series too. I've been looking forward to THE DEMON IN ME, and I'm with you on YA books. I love YA fantasy/parnormal books. thanks for the giveaway & chat! Congrats on the new release Michelle! I sounds like a fabulous read! Out of all your books, is there one you consider your favorite? Hi Michelle. Great interview. My favorite books with demons are Larissa Ione's Demonica series. Congrats on your RT award! I love your Immortality Bites series and glad to hear you have another series with demons! I was wondering will we see Sarah or Thierry in any of your other series, thanks? I've been waiting to get ahold of this book from the first excert you posted. Thanks for the great givaway. I've only read your Immortality Bites series(which I adored) and have been looking for a new series to get started on. 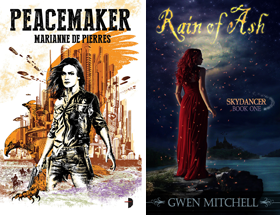 Is it harder to write the YA series than the traditional "adult" books? Congratulations on the new series. I look forward to reading having enjoyed the entire Immortality Bites series. My favorite series featuring demons is the Morgan Kingley series by Jenna Black. Unfortunately, I think it's ending after book 5. @jeanette8042: "Out of all your books, is there one you consider your favorite?" -- Just as if they were children, I love all my books equally but differently. There's a special place in my heart for my first book, Bitten & Smitten, but I gotta say that The Demon in Me features my favorite hero I've written so far. @Jessica: "What is your favorite UF/PNR demon book? (Besides your own of course.)" -- I really loved Jackie Kessler's Hotter Than Hell. my favorite will be Larissa Ione books, Demonica Series ! My favourite UF/PNR series that has demons is the Women of the Otherworld yb Kelley Armstrong. Hi Michelle! 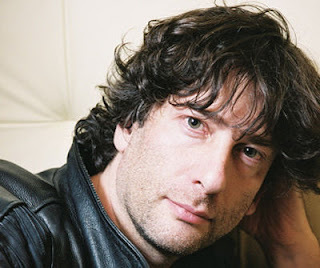 I heart Neil Gaiman too. What is your fav. book by him? Neverwhere is one of my favorite books, of all time! I have yet to read your books, but I'm looking for some new demon love! I would have to say one of my fav. demons is Al from Kim Harrison's The Hollows series. He is fantastic! Pleasure Unbound Demonica Book 1. That is a great series. One of my favorite series featuring demons is the Demonica series by Larissa Ione. Just the very idea of it - 3 demon brothers who run a hospital for demons. My favorite of the series is Wraith but I love them all. My other favorite is Japhrimel from the Dante Valentine series by Lilith Saintcrow. I'm in the middle of that series and loving it. my favorite series with demons is kim harrison's hollows series, but i'm definitely giving your new series a try, michelle! sounds awesome! 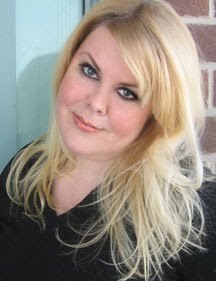 Do you have any ritual or routine to get you in the right frame of mind to right YA or as Michelle Maddox? I like the demons from Kim Harrison's books, even if they can get on my nerves, they're still fun! My favourite demon is Rhyzkahl from the Kara Gillina series by Diana Rowland. Congrats on your new release! It sounds like a real exciting book. I can't wait to read it. My favorite series with demons is Jackie Kessler's Hell on Earth series. Congrats on your new book. Loving the premise for the new series.